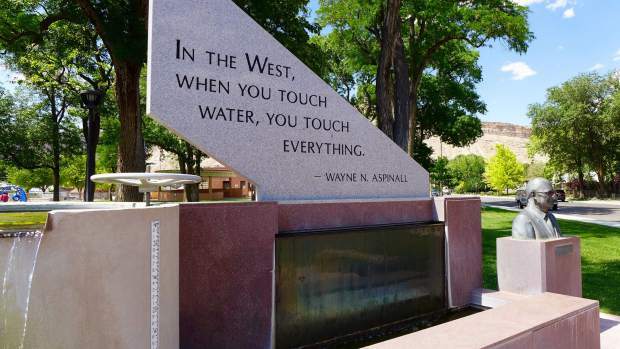 A quote from Wayne Aspinall, the late Congressman from Palisade famous for his work at the national and regional level on water issues, on a statue in a park in Palisade near the Colorado River. Aspinall's quote is often cited by water managers and politicians. Editor’s note: Aspen Journalism is covering the Colorado River basin in collaboration with the Vail Daily. Find more at http://www.aspenjournalism.org. VAIL — During election years in Colorado, it’s routine for candidates for statewide office to address the summer convention of the politically powerful Colorado Water Congress. And what the crowd — water managers and providers, engineers and water attorneys — wants to hear about most from candidates is their position on “storage,” “infrastructure” and “projects,” which are industry euphemism for dams and reservoirs. “Some of this will be larger projects and larger reservoirs, but it will also be dynamic and medium-sized projects that help us store water in innovative ways and balance environmental protection with our needs to build out storage,” Stapleton said. “To many Coloradans in the high country on the Western Slope — some communities that I represented for a decade in Congress — future transmountain diversions pose an existential threat to the health of our rivers and our agricultural economy,” Polis said.